Bringing a new puppy home is one of the greatest feelings out there. You are giving a loving home to a little ball of fur that is sure to bring fond and positive memories yet to come. But, if you want to give your puppy a treat, which ones are safe for them and which are not? Puppies have a delicate stomach, so you want to avoid harsher treats that are meant for adults. 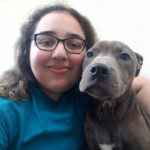 With the best puppy treats, you will not have a problem giving your puppy the occasional yummy treat that they deserve. But what counts as tasty treats for puppies? That depends on your puppy’s preferences. Some may like the meaty taste of a chewy treat while others enjoy the crunch of a biscuit treat. It can be overwhelming to find the puppy treats your puppy will like. To help narrow down the search options, consider trying some of the treats that we believe are good choices to start your puppy on. If you are looking for one of the best dog training treat to give your puppy, then Zuke’s Mini Naturals is one of the better ones to turn. Zuke’s training treats are the ideal size for training as your puppy will be able to eat them easily without forgetting why they earned the treat. Chicken is the first ingredient, making these training treats protein-rich for growing puppies. A healthy blend of whole grains and berries adds extra flavor, and nutrients puppies need. While it does contain grains like rice and barley Zuke’s does not use corn, wheat, or soy products. Each treat is about three calories, but even though the calorie content is low, these treats should only be used for training due to their size. 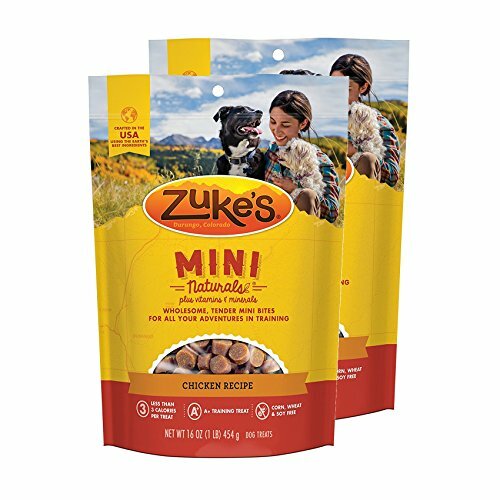 Your puppy will quickly learn that if they listen to your command, they will enjoy the savory taste of Zuke’s Mini Naturals. Perfectly Sized For Training And Is Ideal For Puppies Or Adult Dogs; Comes In An On-The-Go Ready Bag That'S Easy To Take To The Trainer'S Or The Park. With Wholesome Ingredients Like Brown Rice, Potatoes, Oatmeal And Flaxseeds, And Enhanced With Vitamins For Overall Health. Blue Buffalo Blue Bits Training Treats are soft and chewy treats that are ideal training treats for puppies. Blue Buffalo Bits is the perfect size for when you are trying to train your puppy to have some doggy manners. Each dog treat is packed with Omega 3 and 6 Fatty Acids that helps promote healthy skin and coat in your puppy. They also contain DHA which helps support the cognitive development that is essential in puppies. An animal protein is always the first ingredient so your puppy will have a protein-rich treat each time. Your puppy will be able to quickly eat each treat, even if they are losing their puppy teeth thanks to the soft and tasty texture. 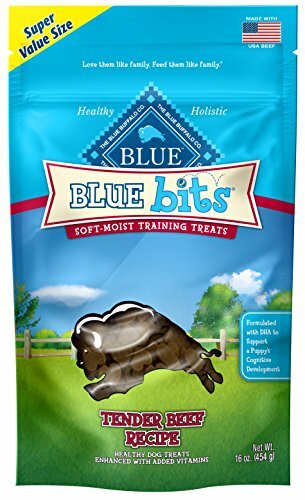 The adorable heart shape of Blue Buffalo Blue Bits Training Treats will show your pup that they are in your heart and you only want to give them the best you can. 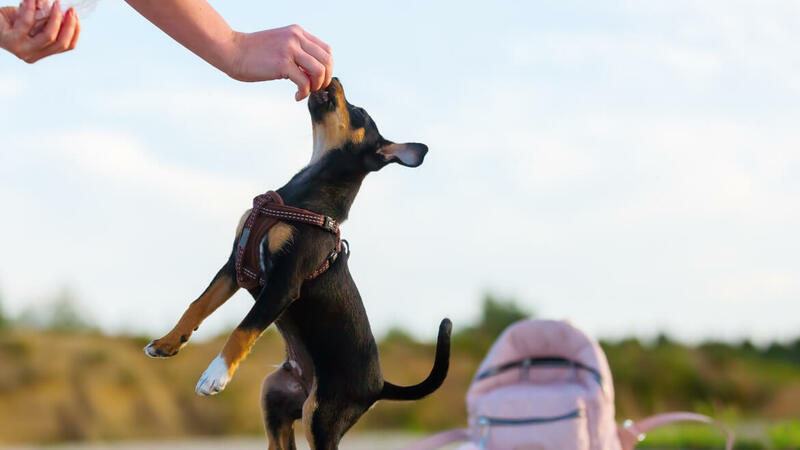 The best treats for puppy training needs to be ones that your puppy can eat easily and quickly, so they do not forget why they earned their treats, like the Merrick Grain Free Power Bites. 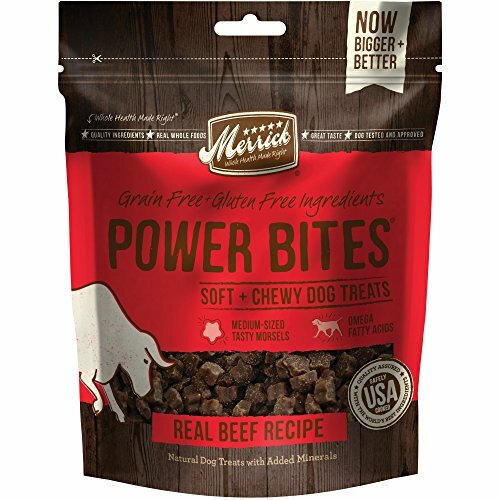 All of Merrick’s Power Bites are made of real deboned meat as the first ingredient so that your puppy can develop healthy muscle tissues and keep their energy levels high. They are gluten-free, grain-free, and contains no artificial flavors, colors, or preservatives. Your puppy will only be eating the highest quality of ingredients all sourced and made in Texas, USA. Such high-quality ingredients include natural and fresh fruits and vegetables packed with the essential nutrients all puppies need to grow. Your puppy will not be able to resist the taste of these Power Bites, so you know they will respond to your commands better and faster. The cute star shape of Merrick Grain Free Power Bites is the perfect size for training your puppy. When puppies start to teeth, then anything that they get in their mouth will become a chew toy. To deter that, give your puppy an Earth Animal No Hide Stix. Earth Animal is a pioneer for creating chew treats that are 100% rawhide free. By being rawhide free dogs of all ages can enjoy these Stix without fear of upsetting their stomach or causing bloating issues. All of the ingredients used are made of natural ingredients that will benefit your dog’s health thanks to it being packed with essential vitamins, minerals, and nutrients. They are long-lasting chews that are perfect for entertaining heavy chewer dogs throughout the day. Even though the chews are durable always monitor your dog as they play, just in case of anything. 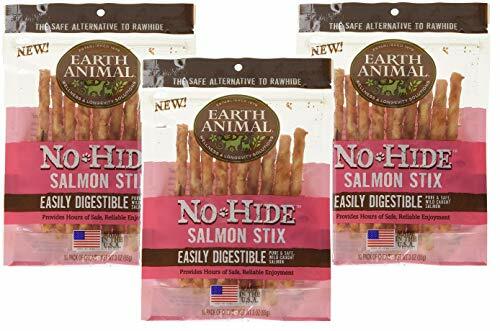 Earth Animal No Hide Stix is the ideal chew treat teething puppies need to satisfy their chewing needs and help improve their overall body health. Puppies need to chew, so if you do not want them to start chewing on your shoes treat them to a Himalayan Dog Chew. 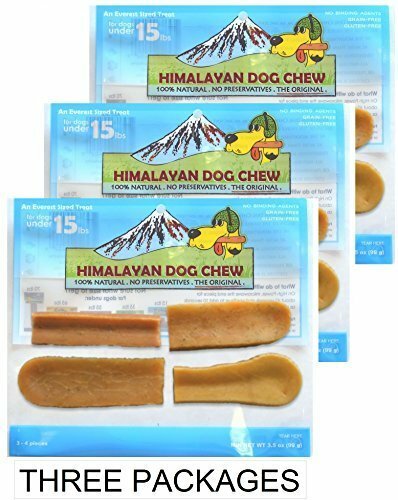 Himalayan Dog Chews are made from an ancient recipe for hard cheese snacks chewed on by the people of the Himalayas. It is made of yak and cow milk and all natural products with no artificial preservatives of binding agents. Puppies will need to chew on the toy for many hours before you start to see them being able to break off pieces to chew. Typically, chew treats have to be taken away when they get too small, but not Himalayan Chews. When they get too small you can pop the piece into the microwave for a few seconds, and it will turn into a tasty and crunchy cheese puff; no waste, only a full-fledged chew treat! Even though Himalayan Dog Chews can get a bit expensive the bigger the size, the investment is well worth providing your dog hours of enjoyable chew time. Greenies Dental Chews is the original dental treat that will clean your puppy’s teeth and freshen their breath. 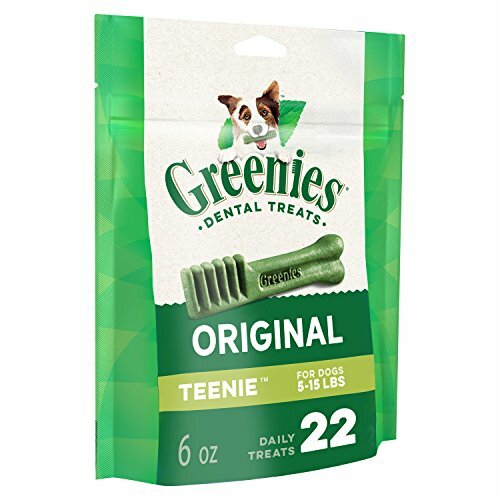 Greenies are irresistible dental treats that all dogs will enjoy chewing on. Its chewy texture fights plaque and tartar as your puppy chews on it. Not only will their teeth be cleaned, but their breaths will stay fresh so you will not have to deal with stinky dog breath again. Greenies are only made of highly soluble ingredients that are easy for your puppy to digest. Veterinarians recommend Greenies as an incredibly powerful, and tasting, at-home oral care solution when you do not have the time to brush your dog’s teeth. If your dog does not let you come near them with a toothbrush, look no further than a Greenie to help maintain positive oral health. If your dogs do not like having their teeth brushed, Grennies Dental Chew’s toothbrush shaped treats are what your puppy needs. Meatballs are delicious meals that we enjoy, but we cannot give to our dog. Well, thanks to Milo’s Kitchen Meatballs your puppy will be able to enjoy meatballs right alongside you. 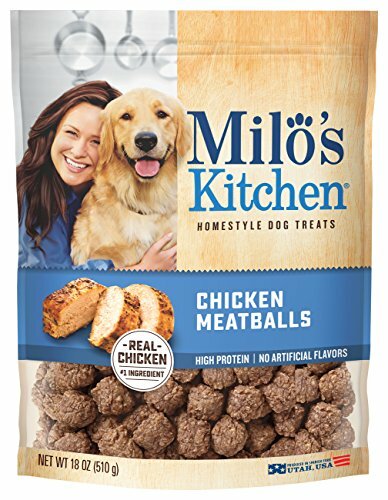 Real chicken is the number one ingredient in these meatballs, meaning that your puppy will have access to a top protein source with each treat. The meatballs are made following a mouthwatering, home-style recipe for savory meatballs any puppy will love to taste. Your puppy will also get a balanced fat and fiber protein source. These meatballs do contain soy products, so if your puppy has stomach sensitivities or allergies, then these may not be the treats for them. But if they are allergy free, then your puppy will love the smoky flavor that these meatballs offer. Be sure to follow the feeding guidelines so that you do not overfeed your puppy. Your puppy will start drooling every time they see you holding a bag of Milo’s Kitchen Meatballs. If your puppy does not like the taste of meaty treats, then they will enjoy the crunchy texture of Fruitables Baked. 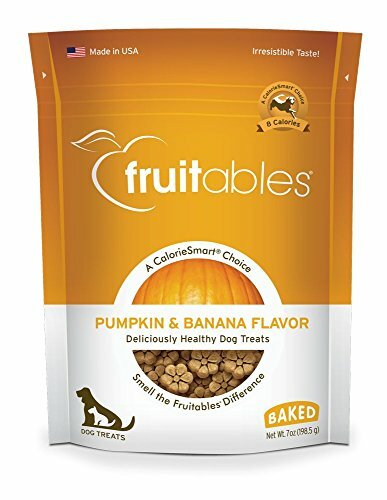 Fruitables Baked uses only organic ingredients, like pumpkin and oatmeal, in their crunchy treats. By going the extra mile of using organic ingredients, your puppy will have access to nutritious and delicious treats. Pumpkin is the first ingredient, which helps ease your puppy’s stomach and provide an optimal fiber source. There are no artificial colors, ingredients, and preservatives used in these delectable treats. 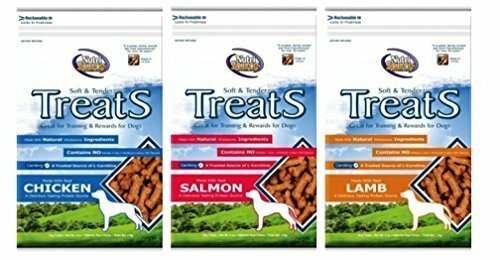 While these treats are packed with an ideal level of essential nutrients, these treats are intended for supplemental feeding only and will not replace your puppy’s proper feeding regime. Crunchy treats might not attract all puppy’s interest, but Fruitables Baked has all of the tastes puppies will not be able to get enough of. When you want a treat that has a wide range of nutrients for your puppy, then Nutrisource Soft Bites are the treats you need. All NutriSource treats contain L-Carnitine that helps build lean bodies by helping your puppy burn fat faster. Real meat is the first ingredient to ensure your puppy is getting the nutrients that their growing bodies need. NutriSource also adds essential vitamins and minerals that provide your puppy is getting a well-balanced treat that will benefit them inside and out. You can give these treats to your puppy to show you care about them, or you can use them as training treats as their size is perfect for rewarding your pup. With the three flavors available you will be sure to find the right taste to catch your puppy’s attention. NutriSource Soft Bites are made of such high quality you can switch between flavors without worrying about upsetting your puppy’s stomach. Dogs need true animal protein to have a properly functioning body, which Real Meat Jerky Treats thoroughly understands. All of the animal proteins used as raised as naturally as possible to ensure they have the highest amount of nutrients, vitamins, and minerals that will benefit a puppy’s growing body. You can choose from chicken, fish, venison, lamb, beef and liver proteins, which provides your puppy with a wide variety of flavors to enjoy. There are limited ingredients used in each bag of treats to ensure that your puppy will have a less likely chance of having an allergic reaction and that they only get the nutrients that they need. No puppy should deserve to eat cheap, low quality treats. 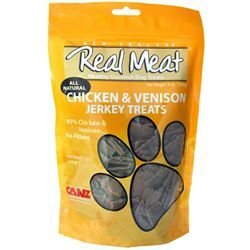 Give them Real Meat Jerky Treats to show that you will do anything to make them happy. If you're worried about cost, we've got your back! We offer lots of pack sizes to help you save money. Buy our standard bulk bully sticks and your wallet will thank you. Generally we carry bulk dog chews in sizes of 10, 25, 50, 100, 250, and up. If you've got an even bigger order, shoot us a message and we'll be happy to accommodate a lower price per stick. At Pawstruck, we want you to be 100% satisfied with your purchase. That's why we stand behind our 30 day SATISFACTION GUARANTEE! If these aren't the highest quality bully sticks you've ever purchased, our customer care team is ready to help. With a huge selection of Dog Chews, Dog Bones, Antlers, and more, we're confident we'll find something to suite your needs. 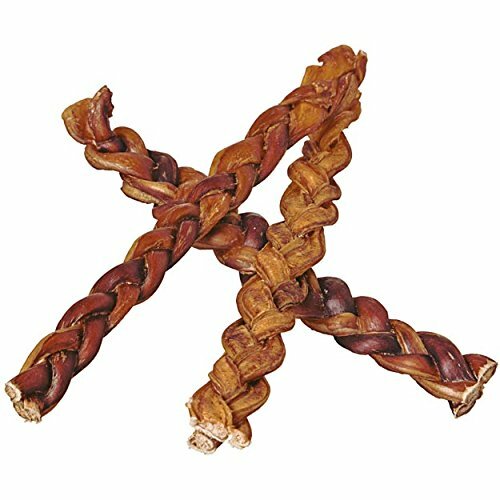 Teething puppies can be a nightmare if they are not given the right chew treat, like a Pawstruck Braided Bully Sticks. Pawstruck uses all natural, hormone-free beef to make their bully sticks. Typically, bully sticks are a single piece of beef that can last a chewing puppy only a few hours. But Pawstruck’s braided bully sticks combines three strong and delicious bully sticks to give your puppy three times the amount of chewing time. That means that they will enjoy a healthy treat and your personal belongings will be safe from their sharp puppy teeth. Always keep an eye on your puppy as they chew, though, to be sure that they only enjoy their treat, not be hurt from it. Let your puppy chew happily on a Pawstruck Braided Bully Sticks to soothe their teething days. Milk-Bone Original Treats are the go-to treats when you want to start your puppy on a yummy biscuit treat. 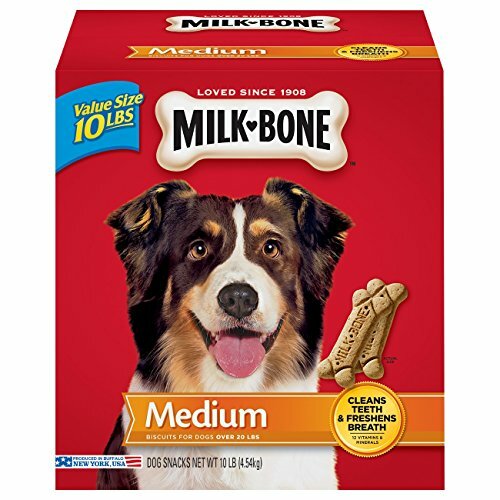 Milk-Bone treats are crunchy treats that satisfy a puppy’s need for a harder texture treat. But the crunchy texture is not just for taste, but it can help your puppy’s dental health by removing plaque and tartar buildup. Each treat contains 12 vitamins and minerals that fortify your dog’s overall body health inside and out. Many pet parents love the quality of Milk-Bone and feel great about giving their puppy these treats, so you should too. But these treats contain wheat, so they are not ideal for dogs with allergies. The recognizable bone shape of Milk-Bone Original Treats will excite your puppy so much that their tails will not stop wagging with joy. If your puppy leans towards biscuit treats and you still want to give them a healthy treat than Blue Wilderness Biscuits are the treats you need. The 100% grain-free treats contain real animal proteins that give your puppy the high-quality protein source they need. Only the finest ingredients are used that are corn free, wheat free, and soy free. There is also no artificial flavors or preservatives used. 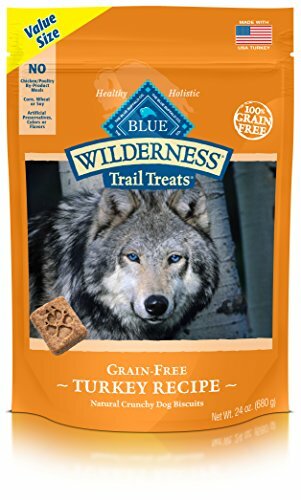 Blue Wilderness Biscuits are chicken free, so that makes these treats safe for dogs who are prone to poultry allergies. Blue uses limited ingredients in their treats to ensure easy digestion on your puppy’s sensitive stomach. Biscuit treats may make a bit of a mess when your puppy eats, but knowing that you are giving them a high-quality treat, like Blue Wilderness Biscuits, will make the mess worth it. Just like babies, puppies experience pain when they lose their baby teeth, and their adult teeth are growing in. 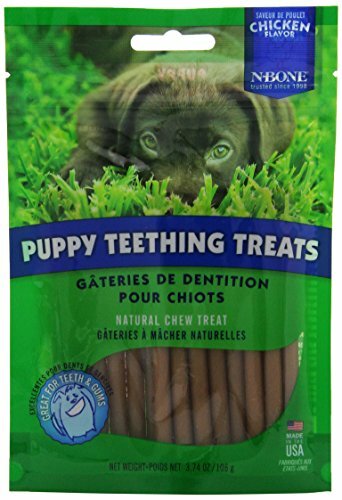 To help satisfy their pain and need to chew give them a N-Bone Puppy Teething Treat. Puppies need a safe outlet to chew and relieve the pain of their adult teeth coming in. To prevent them from chewing at your personal belongings they need a durable chew toy like what the N-Bone offers. N-Bone specially formulates their teething treats to be soft, pliable, and delicious treats that your puppy will not be able to get enough of. The teething treat is fully edible, so you do not have to worry about your puppy eating anything that will harm them. As well, these teething treats will protect immature teeth and ensure that they will have strong and healthy adult teeth. These treats are also packed with added calcium and nutrients that will ensure strong body development and teeth strength. Your puppy will enjoy the soothing relief that the N-Bone Puppy Teething Treat will give them. Delicious does not always mean meaty treats. Treats like Old Mother Hubbard Crunchy Treats can satisfy your puppy’s taste buds. Give your puppy the tasty treat they deserve that not only fills their bellies but gives them the essential nutrients that they need to grow strong and healthy. These oven-baked treats preserve the natural flavors of the high-quality ingredients used to make each delectable treat. While these treats do contain grains, they are wholesome grains that benefit your puppy’s growing bodies. A healthy blend of fruits and vegetables further adds essential vitamins, minerals, and nutrients that dogs of all ages need in order to prosper. The treats are small and easy to chew, but they can be broken down into smaller, bite-sized pieces so dogs of all sizes can enjoy these treats. Only give these treats to your puppy on occasion as it will not replace a proper feeding schedule. 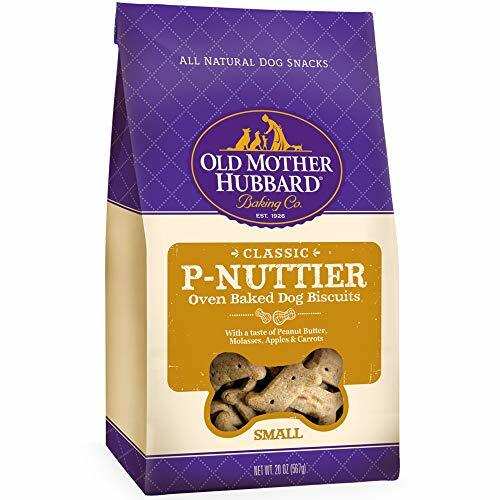 Give your puppy a treat that will make them happy, healthy, and content like Old Mother Hubbard Crunchy Treats. You do not have to spend an arm and a leg on giving your puppy the best puppy treats. Your puppy will be happy with any treat you give them as long as it satisfies their taste. Of course, you do want to be aware if your puppy has any food allergies, so you do not accidentally flare their skin up. But if your puppy does not have allergies than any of the puppy treats we have suggested can be a good fit for them. Whether it be meat treats, biscuit treats, training treats, or the treat just because you love them, your puppy will love any treat that you give them. You may need to experiment which treats will really make your puppy’s tail wag, but puppies are pretty open about trying new foods, so you should have no problem feeding your puppy any of the treats we have suggested. Check out our reviews of the 15 best puppy treats in the market today so you know what you're buying for your furry friends.